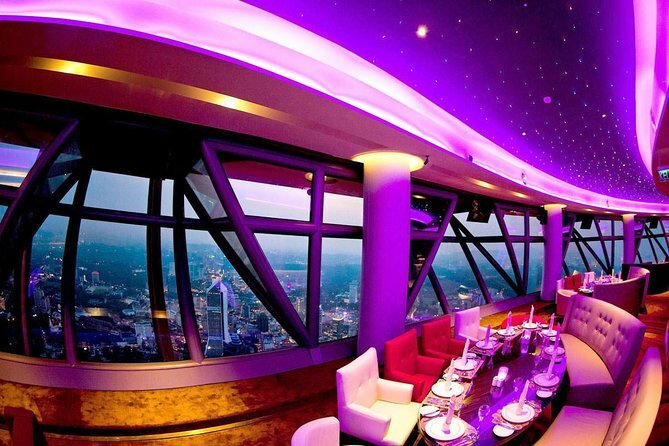 Kuala Lumpur’s Atmosphere 360 restaurant has the highest view in town. At 276m, the viewing deck of Menara KL (KL Tower) is about 100m higher than the Petronas Twin Towers’ sky bridge: Atmosphere 360 is set one floor above it on the second floor of the Tower Head. It is usually called the revolving restaurant at Menara KL. The restaurant Atmosphere 360 offers a modern and authentic buffet of Malaysian and International cuisine. Savouring several meals as a pasta salad with roasted garlic, nyonya piety, tandoori chicken salad and a great selection of cold cut. Over at the hot food counters, indulge in freshly made stir-fried crab with chili paste, patin asam tempoyak, mussel with kam heong sauce and other dishes. The dessert is made up of a selection of freshly prepared confectioneries. - The above rates are not applicable during promotional period or festive season such as Chinese New Year reunion dinner, Chinese New Year brunch, Valentines Day, Secretary Day, Mother's & Father's Day, Independence Day, Ramadan, Christmas Eve & Christmas Day, New Year's Eve & New Year's Day. In Kuala Lumpur Tower, the restaurant Atmosphere 360 offers a lunch buffet with modern and authentic Malaysian and International cuisine. Savouring a lot of dishes as a pasta salad with roasted garlic, nyonya piety, tandoori chicken salad and a great selection of cold cut. Over at the hot food counters, indulge in freshly made stir-fried crab with chili paste, patin asam tempoyak, mussel with kam heong sauce and many others dishes. A modest selection of local fares like Ayam Goreng Berchili and Ikan Asam Pedas are also available for those who need something more familiar. The dessert is made up of a selection of freshly prepared confectioneries. Our lunch buffet serves daily in two sessions from Monday to Sunday. Serving modern Asian cuisine with Continental influences to create celestial flavors, Hi-Tea at Atmosphere 360 is the ultimate way to spend your mid-day break during weekends. The Hi-Tea buffet is complemented by a variety of delicious dishes ranging from salads, Mee Goreng, confectioneries to savory snack foods. Available on Saturday, Sunday and public holidays. For dinner, experimenting the natural transition from day to night because the restaurant transforms into an elegant dining area. The magnificent view of cityscapes, sophisticated ambiance and delectable food ensures that dinner at Atmosphere 360 is truly an unforgettable and luxurious culinary experience. Enjoy an unlimited lavish buffet that complemented by a variety of delicious main dishes ranging from Rendang Tok, Stir Fried Chili Crab, Stir Fried Venison Fillet with black pepper sauce to assorted Dim Sum. A sumptuous choice of desserts completes this feast. Indulge yourself with a selection of wines, cocktails, and energy drinks while listening to wonderful live entertainment. Our dinner buffet serves daily in two sessions from Monday to Sunday. Celebrated a birthday in the revolving restaurant. Paid an additional 5AUD per had for a table against the window which was excellent. Very good selection of food in the large Buffet and well priced. we satisfied with the restaurant, the stunning view, where we can see the Petronas Tower and the menu is so variable and good taste.